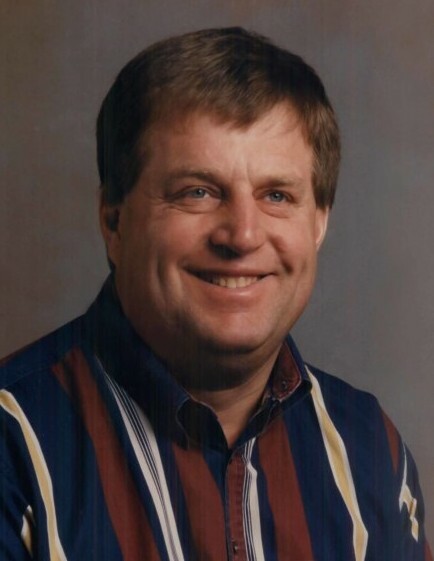 David Haugen, 60, of rural Oslo, MN, passed away at home, early Wednesday morning, January 30, 2019, with his family by his side. David Joseph was born on April 8, 1958, in Warren, MN, to Joseph and Joyce (Monson) Haugen. He was raised in Bigwoods Township, Marshall County, and lived in the same five-mile radius his whole life. When he was a boy, the farm was operated by his dad, and his uncle, Carl. David would later go on to farm the same land with Carl's son, Curtis. “Too Tall,” as he became known by just about everybody, graduated from Oslo High School in 1976 and received his Diesel Mechanics certificate from Area Vocational Technical Institute a few years later. In the following years, David farmed and took many snowmobiling trips, fishing trips, and vacations to Mexico with his friends. After a fateful chance meeting in Grand Forks, David met the love of his life, Linda Reeves. On April 9, 1994, the two were married in Zion Lutheran Church, Oslo. The newlyweds moved into the “little white house” down the road from the farm and began to grow their family. He eventually built a new house for all them on the farm and raised five children, with whom he loved to spend his time. From fishing with the whole family and hunting with the kids, to farming with his son; David shared his love for the land and for God with those to whom he was closest. He enjoyed attending all of his kids' sporting events, cooking dinner, grilling, and gardening. He was on the Bigwoods Lutheran Church council and the Alvarado Elevator Board for a number of years. David is survived by his wife of 24 beautiful years, Linda; mother, Joyce Haugen of Argyle; children, David (Kristie) Hunt and their daughter, Nora, of Grand Forks, ND, and Daniel, Leanna, Deborah, and Matthew Haugen, all of Argyle; sister, Deborah Joyce Haugen of St. Paul, MN; aunt, Helen Aas of Oslo; and many cousins. He was preceded in death by his father, Joe; paternal grandparents, Carl and Selma Haugen; and maternal grandparents, Joseph and Hilda Monson; and many aunts and uncles. FUNERAL SERVICE: 10:00 AM on Saturday, February 2, 2019 at Our Savior's Free Lutheran Church in Argyle, MN. VISITATION: After 5:00 PM with a 6:30 PM prayer service on Friday at Our Savior's Free Lutheran Church in Argyle and one hour before services at the church on Saturday.